The Pivot Table Assistant add-in for Microsoft Excel takes only seconds to install and makes working with pivot tables far easier. It is compatible with Microsoft Excel 2007 to 2019 and Office 365. 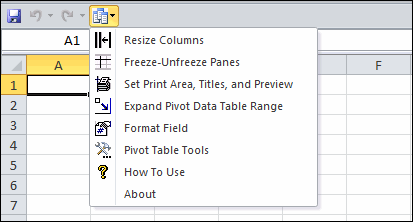 The resize columns feature will resize the columns in pivot table so that extremely wide columns are displayed in a compressed format. The normal Excel default is to make the columns as wide as the text, which makes it difficult to see a table that has long text entries.. The expand a pivot table data range makes it easy to check and modify the data range of a pivot table. Whenever you add data to a pivot table, you will find out very quickly that expanding the data range is not an easy task. The Format Fields feature lets you format pivot table data fiels with with format settings that stay persistent and do not reset when the table is changed. Change sub-total names to remove unneeded words like "sum of"
Insert underlining at page breaks so your printout looks nice!